“(Where) Do We Belong?” is a critical question every immigrant asks themselves every day of their existence. As you enter this exhibit co-curated by La Sala and CoCA featuring work from immigrants who are also artists, you realize how seamless the immigrant experience is in terms of identity crisis, heritage pride and shared pain in the plight of the American Dream. CoCA shares the realities and challenges surrounding immigration with paintings, sculptures and installations, some created in response to President Donald Trump’s “Zero-Tolerance Immigration Policies” and some from the despair immigrants feel in their own skin, regardless of where they call home. Tatiana Garmendia, an art educator who moved to the US as a child refugee from Cuba describes the tragic dissolution of family life and of mental health as a result of the sudden separation of family members when the state intrudes into and disrupts the most tender territory - the domestic domain. In her digital film and animation, “The Unraveling,” Tatiana felt inspired to share her vulnerable story in naked lines because the news never informs people of the devastating consequences to families and to children. The lines in the animation create the connections between us all, even as it condemns the actions of men who tear families apart. Sculptor Humaira Abid created two pairs of intricately designed sandals from wood, one adult sized and the other child sized for her piece “Together But Not Together: Mother and Child.” These sculptures tell the story of children separated from their parents at the border through objects that have been left behind. Japanese American artist Judy Shintani continues to unearth personal stories of Japanese American concentration camps, a history that touched her family 75+ years ago. Her sculpture “Pledge of Allegiance” is a flag constructed of wood from a dilapidated Tule Lake Incarceration Camp barrack, where her father was imprisoned during his teenage years. The pledge of allegiance phrase “with liberty and justice for all” rang hollow during the 1940s when the US government unconstitutionally forced the imprisonment of 120,000 men, women and children of Japanese ancestry in ten incarceration camps. The majority of the prisoners were American citizens and 50% were children. Her installation, “Deep Roots” mourns forced sterilization from the 1930s to the early 1970s of the Abenaki people in Vermont; “Innocent Dreamer” focuses on the Tanforan Racetrack in California that was turned into an assembly center for almost 8000 people of Japanese descent whose only crime was that they were the face of the enemy during WWII. In “Innocent Dreamer” you see a vintage cot with a mattress filled with hay on which an illustration of a child lies, labelled with hope and courage. Jake Prendez questions the idea of “Americana” – the idealized America that has never existed through his painting “Dreamers.” He reimagines the Norman Rockwell images with people of color as the subject and portrays the reality of America. Hawo Ali’s painting 'the Lion and the Bull' is a celebration of her immigrant experience so far and her hopes for this country going forward. At one point this painting hung in the Seattle campaign office for Hillary Clinton and the artist was optimistically hoping to gift it to her. This painting has now come to represent resistance to Hawo. As a participating artist in this show, I was personally moved by our collective experiences. It was profound how the symbolisms of our cultures showed up in our work. It was there in the traditional tea cups that appear in a lot of Hiba Jameel’s work, in the cigarette rolled from a Bengali newspaper in my diptych “Immigrants Never Belong” or in the Mughal miniature style of Humaira Abid’s painting on refugees in Jordan, Kenya and Pakistan. 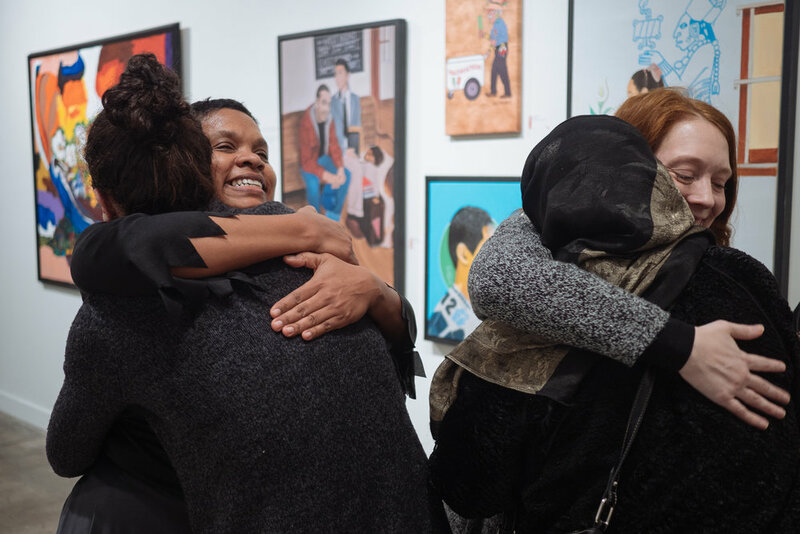 As you look at the stories being told, what stands out is not only a testament of resilience but the processes immigrant artists utilize to heal ourselves. Art has helped Judy Shintani navigate a better understanding of herself, compassion for her family trauma around the incarceration of her father, an understanding of intergenerational suffering and how untold stories can continue to fester and grow in unhealthy ways. For Judy and countless other artists, art is a way to explore, and create ways in and through and around issues and feelings about history. For Hiba, the ritual of creating art was initially a way to unburden her mind from all the chatter and anxieties. As it developed into a full-time profession, it took on a different task. Hiba heals by helping others use art to heal. “I heal when I know my wounds can be used to tell a story to make a difference in the community,” she says. There is also healing that comes from the deeply felt sense of connection that comes from sharing stories. For Tatiana, there is nothing more healing than that. Immigrants and those who are different may feel that they have to hide their culture to fit in and to be safe. Judy Shintani noticed that many descendants of Japanese American incarcerees can’t speak Japanese and she believes that is because of the felt need to assimilate. “I honor our ancestors who did what it took to keep us alive and safe, yet I mourn what we lost, what could have been. But it is never too late to reconnect and discover our beliefs, traditions, and ties to our ancestors” she says. Hiba Jameel feels it is extremely vital to learn the language and culture of the new country you end up living in. “As you understand their ways you will be able to relate to the new place and help others understand, relate and connect with you. Stay optimistic, compete with yourself from yesterday and always aspire to be the best authentic version of yourself. People will see your greatness and will connect with you that way. We all belong to each other on this world once we can speak the same language,” she says. As once a foreign student, then an immigrant and now on my path to citizenship here, I am more determined than ever to “Make America.” I remember when I took mandatory American history classes in college in South Carolina, how people of color were barely mentioned in those history books beyond what we already know about Native Americans and slavery. As minorities, we are a marginalized community, regardless of our contributions to America. It’s time we take it upon ourselves to change this and be the change we want to see by extending our stories to those who may have never had access to someone with a different ancestry than theirs and find commonality and love in our differences. Thank you, CoCA and La Sala, for letting us share our stories.